Last week, I had the honor of addressing the entire Senior High School of the Ateneo de Manila High School to talk about my story as a social entrepreneur, and what led me here. Of course, I connected it to higher purpose and self-awareness. 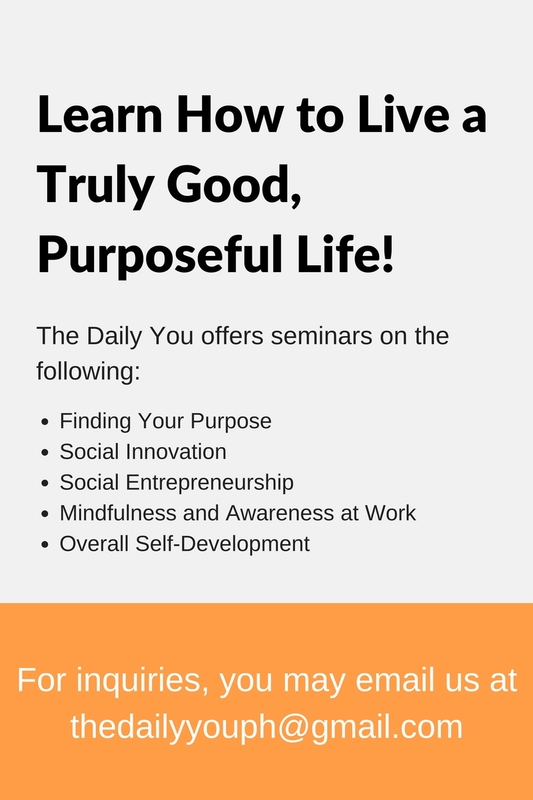 On Saturday, 5 November 2016, The Daily You will kick off inspireD, our department handling motivational speaking and life coaching, with our first talk-workshop and our first offering of “Discovering the Daily Me: A Workshop on Self-Awareness and Finding Your Life Purpose”. It will be from 9:00 am to 12:00 pm (Philippine Standard Time) at Roots Katipunan, a community hub for entrepreneurs, artists, and advocates along Katipunan Avenue in Quezon City, Philippines. From being simply a collection of articles and reflections on how I try to live a responsible life, I’m very grateful and blessed to see how my vision is taking me places I never imagined, and to have inspired someone enough that she herself is now running TDY alongside me (Thank you so much, Lali). We’re really excited for all the wonderful opportunities this brings The Daily You, and we hope you can share it with us! If you’re interested to join the workshop – for which we thank you from the bottom of our hearts – you may sign up at https://goo.gl/forms/A2sxsyG5q0ViM2Ig2. Tags: Discovering the Daily Me, higher purpose, inspireD, Purpose, self-awareness, TDY, The Daily You. Bookmark the permalink.